I knew that the night was off to a bad start when we couldn't find the club. The tiny map on the corner of the flier directed us to an imposing-looking, concrete building with no windows or signs and we almost walked straight past it, but there was something odd about the place that made me hesitate for a second. The building was surrounded by burly security men, there were several strange symbols engraved onto the glass panels on either side of the main entrance and the glass panel above the door bore an engraving of a dragon-like creature swallowing its own tail. I was intrigued by the building and, since we had been wandering aimlessly around the neighbourhood for quite some time, I suggested that we approached the security guards and made enquiries about the location of the club. Amber stepped up and accosted them with her usual flirty charms and it transpired that there was a bar inside the building and The Demeter Club was located on the lower floor beneath the bar, so we were allowed inside and instructed to show the flier to a member of staff who would point us in the right direction. One of the security guards took hold of the large brass handle on the door and hauled it towards himself like opening the heavy door of a bank vault and we were immediately met with the sound of loud music and chatter. I did not expect to find so much activity taking place behind such a mundane looking façade and the interior of the building was surprisingly modern given the drabness of the exterior - lots of clean glass surfaces, sharply angled aluminium fixtures and blue neon lighting. My eye was immediately drawn to an enormous, glass-shelved bar against the only window on the rear wall of the building and every once in a while a car headlight from the street outside would shine through the bottles on the shelves and illuminate them in a mesmerizing array of colours. It was clearly a very popular venue but the room was much smaller than I had anticipated and the heavy security presence outside was massively out of proportion to the overall size of the establishment. An overweight Afro-Caribbean man in a dark green suit greeted us as we entered and so Amber flashed the flier at him and he directed us towards a spiral staircase to the right of the entrance. It was all very exciting and I felt like a V.I.P. - even the staircase was decked out with a plush red carpet for our arrival! The lights and the noise from the bar faded away as we made our descent down the staircase and we continued down the stairs until we were walking in almost pitch darkness and I had to grip tightly onto the handrail for fear that I would lose my footing in the dark (there were blue neon light-fittings on the walls of the staircase that were very pretty indeed but they flickered intermittently and provided very little lighting, particularly on the floor where it was needed the most). At the bottom of the staircase was a dingy-looking corridor that resembled a service corridor in a restaurant and for a moment I thought that we had taken a wrong turn and wandered into an unused underground basement. It wasn’t the cleanest of places; the white walls were covered with brown stains, the lino flooring felt sticky underfoot and the florescent strip lights buzzed very loudly. I nervously suggested that we returned to the bar but Amber was adamant that we were heading in the right direction, so I clung tightly onto Alex’s arm as we ventured further into the darkness. Thankfully, only moments later the muffled sound of music and voices indicated that there were people nearby and then, to my relief, a red-orange glow of light appeared on the wall ahead of us and we emerged into a large room. I heard Amber draw a sharp breath in surprise when we saw the club for the first time. Never before had I seen such a decadently decorated room and my immediate thought was that the drinks must be very expensive! The decor resembled an exclusive restaurant or gentleman’s club and it was in complete contrast to the minimalistic and contemporary-styled venue upstairs. The ceiling was extraordinarily high given that we were underground and in its centre was a magnificently ornate crystal chandelier that bathed the entire room in a glittering, golden glow. Smaller chandeliers were dotted around the ceiling at various points to cast their glimmering light into the darker corners of the room and large mirrors in elaborate gold frames populated the upper section of the walls, which seemed odd as they served only to reflect the light from the chandeliers. 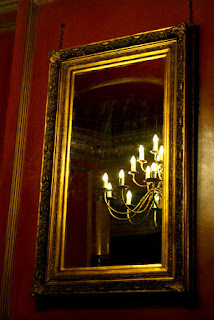 The walls were painted dusky pink with gold panelling and every last inch of available wall space was crowded with old portraits in oval mahogany frames, many of which were too dark or dusty to determine the faces of the subjects. 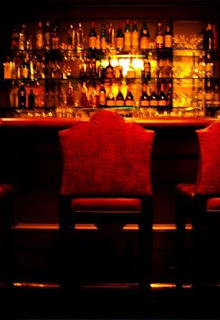 Rather than the obligatory dance-floor in the centre of the room, the entire room was carpeted in a plush maroon carpet and various pieces of antique furniture were scattered around, including a number of shabby leather armchairs and small, ornately carved tables with orange votive candles in the centre. Although the volume of the music was just as loud as the venue upstairs, it had a heavier, industrial beat that was much more sedate than the generic dance music that had greeted us on our arrival in the bar upstairs, which suggested that the patrons of the club preferred to sit and relax rather than drink and dance. And from a quick glance around the room I could see that the clientele were a very exclusive crowd. For instance, seated near to us on a brown leather sofa was a tall, thin women with long, glossy black hair and beside her was a short, exceptionally tanned gentleman dressed in a smart dinner jacket and holding the smallest glass of ruby red port that I had ever seen. There was an air of a hotel or private membership club about the place but fortunately we had dressed appropriately and so we blended in perfectly. We made our way over the bar, which was very impressive in itself. The mahogany wood counter was so highly polished that I could almost see my reflection in it and the entire back wall was mirrored, which I always find off-putting when ordering drinks. The beers were all bottled, the wine list was exhaustive (the availability of several fine wines surprised me greatly) and the cocktail list was very comprehensive indeed. I was fascinated by the bottles on display behind the bar as they were a hotchpotch of different sizes, shapes and colours and resembled an old apothecary shop display; the bottles on the top shelf were extremely dusty and the labels looked hand-painted, two tall red bottles stood to attention at the very front of the shelves like two proud soldiers, four green bottles containing stems of preserved herbs or some other kind of plant matter were situated on either side of the antique brass cash register and there was a small blue bottle on the bottom shelf that was so tiny that I wondered what on earth it could possibly contain. Amber struggled with her drink order for some time in the absence of her usual cheap vodka shots and while I awaited her decision I spotted a round honey-coloured bottle directly in front of me that made me smile. Armagnac. Leonard’s tipple of choice to mark the end of a productive day. And how unusual to find our favourite 'eau de vie’ on display in such a prominent place. I promptly ordered a small Armagnac for myself (the entire group gave me such a strange look) and looked for a quiet corner in which to hide ourselves. Alex became annoyed upon discovering that the barman did not stock his favourite beer and I heard him comment to Graham that the club was not his scene and we should move on elsewhere, but fortunately Graham convinced him to stay for a few more drinks (the music was fairly loud but I could hear every part of their conversation, maybe the peace and quiet in Elmfield House is improving my hearing!). Alex reluctantly agreed, but he was terribly unhappy and he complained repeatedly that the regulars were eyeing us suspiciously. I must confess that I also experienced an occasional twinge of paranoia, however once we had our drinks in-hand I began to feel very comfortable in the room. In fact, as the evening progressed I felt quite at home. I don’t recall drinking more than one or two drinks but I do remember feeling very intoxicated at an embarrassingly early stage of the evening and grabbing Amber’s hand, dragging her out of our corner and insisting that she danced with me. I must have been dancing quite provocatively because I vaguely remember Alex warning me that I was making quite a show of myself and then later hearing him complain that I was pawing at him and my public displays of affection were humiliating him. Even Amber commented on how outrageous and confident I was acting which, coming from her, was very sobering indeed. I think I even flirted with Graham at one point; I’m not quite sure what possessed me! I was deeply engrossed in a loud and unashamedly drunken conversation with Graham when Amber shouted in my ear and asked if I would accompany her to the ladies toilets. The room was rapidly filling up with people and I was reluctant to surrender my perfectly positioned spot by the bar, but before I could reply she had a tight grip of my wrist and I was being led away from the group. My balance was seriously impaired and I negotiated - or rather stumbled - my way through the crowd with great difficulty, convinced that everyone was deliberately bumping into me and glaring angrily at them and as Amber led me deeper into the centre of the room I was sucked further and further into the tightening quicksand of sweaty limbs and grotesquely beautified faces, but I had become a confident drunk at that point and I refused to yield to the crushing weight of bodies that squeezed against me, choosing instead to fight my way amongst them, knocking drinks into the air and causing people to curse us as we forced our way between them. I deliberately avoided eye-contact as I pushed between body after body, but when one tall figure brushed past me I was seized by an overwhelming feeling of recognition that stopped me dead in my tracks. In the split second that we made contact I recognised him. Luke. I think it was his smell or maybe a touch that he gave me as he passed by. I honestly can’t remember. I swear it was Luke. In fact I was so convinced that I almost shouted out his name. I searched the faces around me for another glimpse of him but Amber had a tight grasp on my wrist and she was dragging me along so forcefully that we were both quickly swallowed up by the crowd. Perhaps it was the comforting thought of Luke’s presence or it was just the cold, harsh fluorescent lighting of the ladies toilets that had an instantly sobering effect on me and brought the entire evening into perspective. As I stood in the ladies toilets waiting for Amber my mind began to race with thoughts of Luke. I missed him so very much and I secretly hoped that he was in the room somewhere, just watching, as always. But Alex was waiting at the bar and if Luke was in the same room then that would certainly have made for a very uncomfortable meeting. And the more that I thought about Luke the more I understood why I had been behaving so outrageously all night; I suspected that the Armagnac was more potent than I was accustomed to or someone had spiked my drink, but then, on further reflection, I realised that my behaviour had been typically ‘Luke-like’ all evening and I was exhibiting all the rebellious, sexually aggressive and narcissistic aspects of his personality that I detested – and admired – so much about him. I was not imitating Luke, I was becoming like him. I spent the remainder of the evening propped up against the bar and desperately searching the crowd to catch sight of Luke - I even feigned interest in a portrait hanging on the wall next to the men’s toilets and persuaded the group to move closer to it in the vain hope that he might eventually need to relief himself! But I did not see him again and, if I’m honest, I’m not entirely convinced that I saw him in the first place. My mind has been playing these kinds of strange tricks on me recently. Alex became annoyed by my odd and erratic behaviour and he reprimanded me several times for being either too distant or too flirtatious, then around two o’clock in the morning he insisted that we left the club and returned home (well, he threatened to leave and recommended that I followed him). I was reluctant to leave at first but Amber and Graham agreed that the night had run its course and we should make our way home, so we left the club and headed out towards the main street to find a taxi. Stepping out from any bar or club into the centre of town in the early hours of the morning is like stepping into Hell itself. Streams of people negotiate the perilous journey from one club to the next and the long queues outside popular venues often run the entire length of the street, leaving very little room on the pavement and forcing the crowds to spill out into the gutter. Taxis cruise up and down looking for fares and cars crammed with young men race along the street, honking their horns and braking violently to shout abuse at the drunken women tottering along the pavement. Amber has always been comfortable with this type of nightlife and so she and Graham pushed on ahead of us towards the thumping music coming from the main street. Alex and I were following behind and we had almost caught up with them when, for no particular reason that I can recall, I glanced behind. There was a man walking a short distance behind us. He caught my eye because he was not a typical late-night reveller; he appeared to be in his sixties, he was quite broad-set with shoulder-length dishevelled grey hair and he was wearing an equally unkempt dark grey suit. Walking home alone late at night has made me wary of this type of suspicious figure, but I felt safe alongside Alex and so I paid him little attention and picked up my pace to keep up with the rest of the group. The main street was as chaotic as I expected and our pace slowed considerably when we met with the large volume of clubbers, many of whom appeared to be students also celebrating their graduation. It was essential that the group kept closely together in order to avoid being accosted by drunks or club staff distributing leaflets and so I began walking faster to keep up with Alex, all the while stealing an occasional glimpse of the man following behind. The man was at a reasonable distance from us but he was gaining ground quickly and there was an air of determination in his increasing speed and fixed stare that unnerved me and filled the pit of my stomach with a heavy sense of dread. More people stepped into my path and for a second I lost sight of Alex’s jacket which caused me to panic. Although only a few feet away from my closest friends, I felt tremendously isolated and vulnerable and I was gripped by a fear that I have not experienced since I was a young child; it was the absolutely terrifying, nightmarish feeling of being chased. Alex, Amber and Graham were pushing steadily ahead of me through the crowds and I realised that I would not be heard if I was to shout to them and so, riddled with panic and in a desperate bid to catch up with the group, I stepped off the pavement and into the gutter. Cars whipped past me, their headlights throwing my shadow across the tarmac and when I glanced over my shoulder towards the approaching traffic I could see the silhouette of the man framed in bright car headlights as he fought his way through the crowd. My mind was screaming for someone to help me but I realised that no-one was going to intervene and so I calmed myself and mumbled a few words that I had read in The Omega Course in the vain hope that something or someone – Luke, or Daniel perhaps - might hear me and come to my aid. It was a desperate act, but if there was anything that I could do to protect myself then I would try it. I hesitate to say that there was an immediate response to my plea because I was in an extremely drunken and emotional state at that point in the evening. The intoxicating effects of the alcohol combined with my physical exhaustion and the emotional strength that I took from thinking about Daniel may have contributed to the physical and psychological transformations that I experienced directly after saying these words, but nevertheless my focus seemed to clear and I was enveloped by a discernible warmth that wrapped itself around me like a blanket. The comforting feeling of security reminded me of times when, as a child, I would pull the bedcovers over my head to protect myself from scary noises during the night; I knew that the scary monsters were still in my room but I was hidden and protected beneath the covers. In a similar way, my awareness of the man chasing behind me was not entirely eliminated, but this sense of reassurance served to steel my nerves and subdue the panic that was threatening to overwhelm me. As I contemplated the source of this new-found strength, I felt another emotion beginning to stir deep inside me. It was the overconfident and outrageous bravado that I had been wallowing in all night, but it was a thousand times more powerful than I had experienced previously in the club. I could feel myself growing in confidence and becoming progressively hostile to everyone around me and I was possessed by a feeling of playful mischievousness and childish provocation that goaded me to grab hold of passers-by, although I did not understand why. I resisted this temptation because I could sense the familiar stirrings of uncontrollable brutality that were brooding just beneath the surface of my skin and I did not trust myself. Fortunately I succeeded in diverting my attention away from my fellow revellers and towards my pursuer and, as my unhealthiest of appetites hit a dangerously high point, I was possessed by an overwhelming urge to turn and confront him. I was only seconds from turning and making a stand against the stranger when Alex came up alongside me, made a wisecrack about my potential as road-kill and hauled me back onto the pavement, wrapping his arm around me and helping me to negotiate the oncoming crowd. I clung to him and buried my head in his chest, half expecting the man to place his hand on Alex’s shoulder or to pass us by. But he didn’t catch up with us. And in my heightened state of bravery I didn’t much care if he did.